Wedding dress retailer Alfred Angelo declared bankruptcy on Friday, closing their 60 retails stores and leaving many brides distraught as it became unclear whether they would receive their dresses or get a refund. Fortunately for the desperate couples, social media sprang into action. Women across the country have been using the hashtags #AlfredAngelo and #DressMatchMaker to offer to loan out their own wedding dresses. One woman generously posted "Any women in the SoCal area that need a wedding dress ASAP bc of #alfredangelo closing, I will lend you mine!" on Twitter. Some companies have been offering discounts to Alfred Angelo customers affected by the bankruptcy, or waiving rushed delivery fees. "If you've been affected and can send proof, I will give you my dress for free. DM me. Needs to be cleaned and shipped," wrote another altruistic individual on social media. Another woman who no longer needs her wedding dress added, "Any DFW bride affected by #AlfredAngelo that needs a dress ASAP I have an unaltered ivory Watters size 10 with belt!" 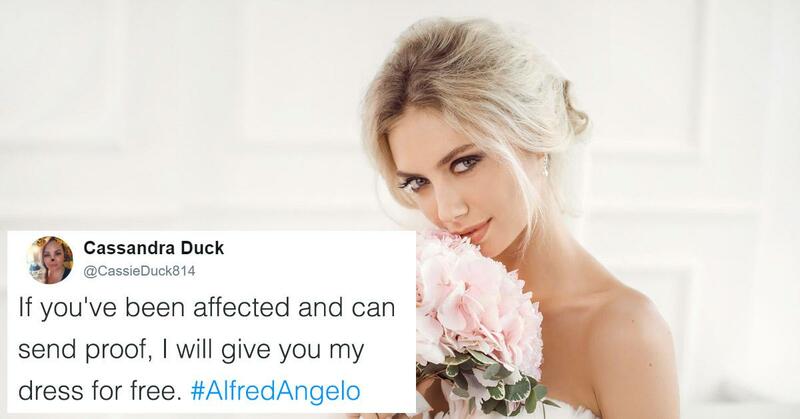 In a statement, Alfredo Angelo urged brides to email alfredangelo@mjstrustee.com to check their order status. "We will post additional information regarding the status dresses on this website as it becomes available," they added. "We apologize for the inconvenience and hardship resulting from this event." But that didn't stop Twitter from coming to the rescue. "I heard the news! I have a size 18/20 dress that I would happily part with to a bride in distress!" wrote one woman on the platform. And it looks like some brides have already had their special day saved by some very generous ladies who no longer needed their wedding dresses as much as others who are about to walk down the aisle for the first time. One grateful bride wrote, "And on this day my Fairy Godmother rescued me. A generous donor is sending me a brand new designer wedding dress for free." Social media can be awesome at times.